MOTs from your local garage in Moreton. 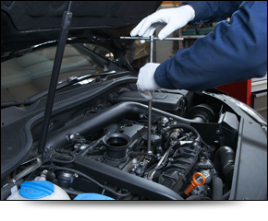 At Action Services we offer the standard Class 4 MOT that covers the majority of non-commercial cars and vehicles. Our MOTs cover an extensive range of checks that will help your vehicle perform properly and stay on the road for longer. We are a VOSA appointed garage that is authorised to carry out MOTs. Our MOT Nominated Testers are accredited by VOSA to check your vehicle against specific safety criteria. These checks can pass your vehicle if it is acceptable or fail it if not. The acceptable standards are recorded in the current Vehicle and Operator Services Agency (VOSA) Vehicle Inspection Manual. Please note, your assessment will be based on the condition of your vehicle on the day it is tested. You can book your MOT up to 28 days in advance of its due date. What if my vehicle fails the MOT? If your vehicle fails, it does not meet the minimum legal requirements and must be repaired to comply with an MOT test if you are to keep the vehicle on the road. The notes given by your Nominated Tester will advise you of any remedial work that can be done. If you think the Nominated Tester has been unfair you can appeal by asking for a VT17 form - it will explain what you will need to do to make an appeal.